Brian Myers (born April 20, 1985) is an American professional wrestler and promoter. He is currently signed to WWE, where he performs on the Raw brand under the ring name Curt Hawkins, in which he is one-half of the Raw Tag Team Champions with Zack Ryder in their second reign. Myers signed with WWE in 2006 and was assigned to their developmental territories. In 2007, he was called up to the main roster and would eventually win the WWE Tag Team Championship with Zack Ryder. In 2014, he departed from WWE and returned to the independent circuit and worked there until 2016 when he re-signed with WWE. Shortly after his return, he amassed a WWE record 269-match losing streak which ended at WrestleMania 35 when he won the Raw Tag Team Championship with Ryder, almost 10 years after they last held any titles as a team. Myers was born on April 20, 1985, in Glen Cove, New York. After he decided to pursue a professional wrestling career, Myers began training under Mikey Whipwreck. After being trained by Mikey Whipwreck, Myers made his debut in 2004, using his real name. He wrestled for the New York Wrestling Connection (NYWC) promotion. He began regularly teaming with Brett Matthews and the duo of Myers and Matthews went on to defeat the NYWC Tag Team Champions Dickie Rodz and Mason Raige by disqualification, for which titles do not change hands. At the next event on June 4 they won a rematch decisively to become Tag Team Champions. Later that month they were attacked by The Dead Presidents (Lo Lincoln and Boog Washington) to set up a feud where they eventually lost their titles against them in July. On September 23 they were entered into a three way match with the champions but Team Tremendous (Dan Barry and Ken Scampi) ended up with the belts. After continuing to win matches they re-earned a match against Team Tremendous and won the titles for the second time on January 25, 2006. They held the titles until they faced the B.S. Xpress (Tony Burma and Mike Spinelli), who defeated them for the gold on March 26. On February 24, 2006, Brian Myers signed a developmental contract with World Wrestling Entertainment. He was given the ring name Brian Majors and teamed up with his former tag team partner Bret Matthews, who was renamed Brett Majors, to form the tag team the Majors Brothers. Together they won the Deep South Wrestling DSW Tag Team Championship on two occasions. They later won the OVW Southern Tag Team Championship. The team was moved from the developmental territories to the main roster, changing their last names from "Majors" to "Major". The team worked on WWE's ECW brand. The team won their debut match against Matt Striker and Marcus Cor Von of The New Breed on the May 1 episode of ECW, but failed to win any matches in either singles or tag team competition following their debut on the brand. They moved from ECW to SmackDown! as the eighth pick in the 2007 Supplemental Draft. They made their SmackDown! debut on July 6, defeating jobbers Jeremy Young and Mike Fox. On the November 9 episode of SmackDown!, they received a WWE Tag Team Championship match after winning a #1 contender's battle royal, but lost to WWE Tag Team Champions Montel Vontavious Porter and Matt Hardy in their title match. At Armageddon, the duo dressed up as Edge and interfered in the World Heavyweight Championship match also involving The Undertaker and Batista, replacing Edge during the match to help him win the title, turning heel for the first time in their WWE career. On the December 21 taping of SmackDown!, the Major Brothers were revealed as acquaintances to Edge and his lover, SmackDown General Manager Vickie Guerrero. The Major Brothers were repackaged and renamed as Curt Hawkins and Zack Ryder, with Brian Major becoming Curt Hawkins and Brett Major now named Zack Ryder. Their team name also became The Edgeheads, due to their resemblance to him. On the January 4, 2008 episode of SmackDown!, Hawkins and Ryder competed against Batista in a 2-on-1 handicap match to a draw in a Beat The Clock Challenge when the time ran out. After assisting Edge in most of his matches for multiple months, Hawkins and Ryder captured the WWE Tag Team Championship from John Morrison and The Miz in a fatal-four way tag team match, which also featured Jesse and Festus and Finlay and Hornswoggle at The Great American Bash in July, becoming the youngest tag team champions in WWE history up to that point. By SummerSlam in August, La Familia had begun to fracture and Hawkins and Ryder began appearing on their own. On the September 26 airing of SmackDown, Hawkins and Ryder lost the titles to Carlito and Primo Colón in their first televised title defense. On April 15, 2009, Ryder was drafted back to the ECW brand as part of the 2009 Supplemental Draft, separating the team. Following the draft, Hawkins was on hiatus from television before voluntarily leaving the main roster and transferring to Florida Championship Wrestling (FCW) for more training. He made his debut losing to Dawson Alexander. In the following weeks, Hawkins won an 8-man battle royal to become the number one contender for Justin Angel's FCW Florida Heavyweight Championship, then lost the championship match. He joined a stable called "The Dude Busters" alongside Caylen Croft and Trent Barreta on November 1, 2009. In late November, Hawkins and Croft won the FCW Florida Tag Team Championship. While they were champions, Croft and Hawkins defended the title with Barreta via the Freebird Rule. On January 14, 2010 at an FCW television taping, The Dude Busters lost the FCW Florida Tag Team Championship to The Fortunate Sons (Brett DiBiase and Joe Hennig). Hawkins returned to the SmackDown roster on May 4, 2010, forming a tag team with Vance Archer, defeating Chasyn Rance and JT Talent in a dark match. They made their television debut as a team on the May 13 episode of WWE Superstars, defeating two local competitors. After the match, Hawkins stated that he and Archer had been given a 30-day contract to "make an impact". The team made its SmackDown debut on the May 21 episode, winning another squash match. In an attempt to make an impact, the duo attacked Montel Vontavious Porter and Christian on consecutive episodes of SmackDown on June 4 and 11, which they followed up on by defeating both in a tag team match on June 18. The next week the duo was officially named "The Gatecrashers". The pair also competed in a battle royal on the June 4, 2010 episode of SmackDown to replace The Undertaker in the World Heavyweight Championship fatal four-way match at Fatal 4-Way. Hawkins was one of the four final participants in the match, but was eliminated by the eventual winner, Rey Mysterio. After their 30-day contract expired, they were signed to new long-term contracts in storyline. The team came to an end on the October 7 airing of Superstars after a match between Archer and Chris Masters. Archer accidentally struck Hawkins outside the ring after which the two argued and a distracted Archer lost the match. Afterwards, Hawkins assaulted Archer. Hawkins moved to singles competition the following week, defeating Trent Barreta. A rivalry then began between the two shortly after, with Barreta getting the win on the November 18 episode of Superstars. In a rematch the next week, Hawkins defeated Barreta, claiming Barreta's win the week before was a fluke. The feud ended with Barreta coming out on top when Barreta beat Hawkins on the December 9 episode of Superstars. On April 26, Hawkins was drafted to the Raw brand as part of the 2011 Supplemental Draft. Hawkins and Ryder had a brief reunion on the May 19 episode of Superstars, where they teamed together in a losing effort against Kozlov and Santino Marella. After Hawkins beat JTG on the May 26 episode of Superstars, Hawkins returned on the September 8 episode of Superstars, teaming with Tyler Reks to defeat Percy Watson and Titus O'Neil. Hawkins and Reks then began appearing on the fifth season of NXT, by attacking the Usos from behind on the September 27 episode of NXT. Over the next two weeks on NXT, Hawkins and Reks faced the Usos in tag team matches, with Hawkins and Reks winning the first match and the Usos winning the second match. From October 2011, Hawkins, claiming a broken ankle, began to carry around a metal walking cane. However, when Hawkins' injury had healed sufficiently for him to wrestle, he still brought the cane with him to the ring. Hawkins and Reks then lost a non-title match to Air Boom on the December 22 episode of Superstars. Hawkins debuted on Raw on January 9, 2012, and was quickly defeated by a returning Brodus Clay. Hawkins and Reks feuded with Trent Barreta and Yoshi Tatsu from December 2011. Both teams regularly played pranks on each other, Tatsu being locked in a closet and Reks' hands being superglued onto an Xbox controller. The feud ended when Hawkins and Reks defeated Barreta and Tatsu on the January 18 episode of NXT. Hawkins and Reks then became NXT's troublemakers, tormenting NXT host Matt Striker on his lacklustre career and how they should be main-eventing NXT, even once going to the extent of assaulting him after a match. This forced Striker to appoint William Regal as NXT's prime authority figure on the February 29 episode of NXT. Regal often employed harsh measures to keep Hawkins and Reks in line, including threatening suspensions for bad behaviour and condemning them to janitorial duty, this caused them much frustration. On the March 21, 2012 episode of NXT Redemption, a storyline began in which Striker was knocked out with chloroform by Johnny Curtis and Maxine, and then Striker was kidnapped by unknown persons, later revealed to be Hawkins and Reks, who intended to blackmail Maxine into using her charms to get Regal to leave them alone. Unfortunately for Hawkins and Reks, Striker was rescued by Derrick Bateman and Kaitlyn. On the April 18 episode of NXT, the freed Striker confronted Hawkins and Reks about the kidnapping, and Hawkins admitted the crime. As punishment, Regal put Hawkins and Reks in a match against each other, with Striker as referee. The loser would be fired. Even though Reks won to supposedly save his job at the expense of Hawkins', Regal decided to fire Reks as well, sending the two troublemakers away from NXT. However, Regal could not keep the duo away from NXT for long, as they managed to convince villainous higher authority figure John Laurinaitis to rehire them as NXT's security team on the May 9 episode of NXT. Hawkins and Reks continued to act as Laurinaitis' lackeys, confiscating anti-Laurinaitis signs at Over the Limit and attacking John Cena on the May 21 episode of Raw. Hawkins and Reks' association with Laurinaitis ended after Laurinaitis lost his job at No Way Out. On the final episode of the fifth season of NXT on June 13, Hawkins and Reks defeated Percy Watson and Derrick Bateman. Hawkins and Reks engaged in a one-sided feud with Ryback in July 2012. After both Hawkins and Reks lost singles matches to Ryback on SmackDown, Ryback defeated both of them in a handicap match at Money in the Bank. At Raw 1,000, Hawkins and Reks, along with four other wrestlers, attempted to ambush Kane to make a statement, but a returning Undertaker interrupted the attack and The Brothers of Destruction disposed of Hawkins and Reks. They again lost to Ryback on the August 6 episode of Raw. After being told by SmackDown General Manager Booker T to "step it up", Hawkins and Reks debuted a stripper gimmick on the August 17 episode of SmackDown while squashing a jobber tag team. A week later, Reks asked for his release as he intended to retire from wrestling to spend more time with his family; he and WWE parted ways on August 21, thus ending the team. In October, Hawkins announced that he had undergone surgery for a torn posterior cruciate ligament and meniscus. On the January 21, 2013 Raw, a short-haired Hawkins returned on television tapings in a show-closing brawl. He made his return match on the February 9 episode of Saturday Morning Slam, losing to Justin Gabriel. After that, Hawkins most commonly appeared on Superstars and NXT, where he lost all of his matches. On the May 8, 2014 episode of NXT, Hawkins competed in a battle royal to determine number one contender for the NXT Championship, in which he was unsuccessful. On the May 22 episode of NXT, Hawkins faced Adrian Neville in a losing effort. On June 12, WWE announced that Hawkins was released from his contract. A day after his release from WWE, Myers wrestled at a Jersey Championship Wrestling (JCW) event, teaming with Val Venis to defeat Danny Demento and Erik Andretti. On August 29, 2014, Myers made his debut for Pro Wrestling Guerrilla (PWG), losing to A.J. Styles in the first round of the 2014 Battle of Los Angeles. In April 2015, Myers defeated Brent Banks, in Alpha-1 Wrestling, to win the A1 Alpha Male Championship and the first singles championship in his pro wrestling career. He would later lose the title, in June, to Josh Alexander. In June 2015, Myers defeated Chris Payne, in Pro Wrestling Syndicate (PWS), to win the PWS Television Championship. On July 24, 2015, Myers entered Global Force Wrestling (GFW) tournament to crown the inaugural GFW Global Champion but lost in the quarterfinal round to Chris Mordetzky. In August 2015, Myers defeated Papadon, in Five Borough Wrestling (FBW), to win the FBW Heavyweight Championship. In September 2015, Myers lost his PWS Television Championship to Chris Payne. In December, Myers regained the title after he defeated Payne in a ladder match. In April 2016, Myers defended his FBW Heavyweight Championship in a Fatal 4-Way match and lost his title to Mike Verna. Myers made his Total Nonstop Action Wrestling (TNA) debut representing GFW on the July 27, 2015 episode of Impact Wrestling, where he teamed with Trevor Lee and lost to The Wolves. On the September 2 edition of Impact Wrestling, Myers and Lee defeated The Wolves in a rematch to win the TNA World Tag Team Championship. The next week on the September 9 edition of Impact Wrestling, they dropped the title back to The Wolves, ending their reign for only one day. On the September 16 edition of Impact Wrestling, Team GFW (Myers, Jeff Jarrett, Eric Young, Chris Mordetzky and Sonjay Dutt) lost to Team TNA (Drew Galloway, Lashley, Eddie Edwards, Bram and Davey Richards) in a Lethal Lockdown Match. At Bound for Glory, he and Trevor Lee had a rematch for the TNA World Tag Team Championship against the Wolves, but failed to win the titles. On July 21, 2016, Myers signed to make his return to WWE and joined the SmackDown brand. 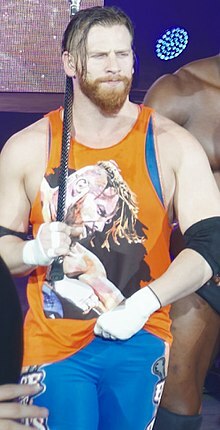 Myers returned to WWE under his Curt Hawkins ring name in vignettes, stating that it was "time to face the facts" in similar vein of the well-known Chuck Norris facts, beginning in August. This continued until it was announced that he would make his televised in-ring return at the No Mercy pay-per-view. At the event, he "stepped into the ring" and announced his debut match to take place on that week's episode of SmackDown Live. However, the scheduled match was bumped from the show due to time constraints. The week after on SmackDown Live, Hawkins was scheduled to face Apollo Crews. After Crews punched Hawkins, Hawkins left the ring before the match could start. Jason Powell of Pro Wrestling Dot Net described Hawkins' gimmick as an "obnoxious heel" that "bounces from being funny to groan-inducing", while praising Hawkins' performance. Hawkins' actions were also widely compared to that of Eva Marie, in which Marie would fake unfortunate events to avoid in-ring competition. On the November 1 episode of SmackDown Live, Hawkins accepted Dolph Ziggler's first open challenge for the Intercontinental Championship, losing to Ziggler in seven seconds. On the November 8 episode of SmackDown, Hawkins earned his first televised victory since returning by defeating Apollo Crews, which would be his last televised victory until 2019. On the TLC: Tables Ladders and Chairs pre-show, Hawkins made his pay-per-view in-ring return, where he teamed with The Ascension and The Vaudevillains against Apollo Crews, American Alpha, and The Hype Bros in a losing effort. On the March 14, 2017 episode of SmackDown Live, in a backstage segment, Hawkins declared he would be competing in the André the Giant Memorial Battle Royal at WrestleMania 33, where the match was won by Mojo Rawley. On April 10, Hawkins was moved to the Raw brand as part of the Superstar Shake-up. During this time, he suffered many losses to Apollo Crews, Finn Bálor, Seth Rollins and Jason Jordan. In July 2017, it was revealed that Hawkins had a losing streak of 100 matches, claimed by WWE to be the longest losing streak of the 'modern era'. This was soon included into Hawkins’ gimmick. At Great Balls of Fire on July 9, Hawkins competed in his only main card pay-per-view match of 2017, in a quick loss to Heath Slater. By the end of 2017, Hawkins failed to win a match, ending the year with over 150 consecutive losses. 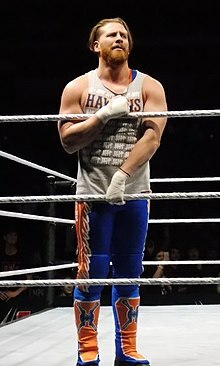 In early 2018, Hawkins regularly wrestled on Main Event and continued his losing streak, with Hawkins achieving numerous near falls and being described as a "sympathetic figure at this point." At WrestleMania 34, Hawkins competed in the André the Giant Memorial Battle Royal which was won by Matt Hardy. At the Greatest Royal Rumble, Hawkins entered at number 43, but was quickly eliminated by Braun Strowman. On the June 4 episode of Raw, Hawkins earned his 200th consecutive loss to a local wrestler after Baron Corbin interrupted Hawkins' match and attacked his opponent, causing Hawkins to lose via disqualification. In November, Hawkins competed in the second season of WWE Mixed Match Challenge, teaming with Ember Moon after Moon's previous partner Braun Strowman was unable to compete due to an elbow injury. On November 27, Hawkins and Moon were eliminated from the competition, losing to Jinder Mahal and Alicia Fox in the quarterfinals. On the January 21, 2019 episode of Raw, Hawkins attempted to persuade Vince McMahon into booking him in a match, but was instead inserted as the special guest referee for The Revival's (Dash Wilder and Scott Dawson) Raw Tag Team Championship match against Bobby Roode and Chad Gable, in which The Revival lost after Hawkins witnessed them attempting to cheat three times, allowing Roode and Gable to win. After the match, Hawkins turned face after he was attacked by The Revival, until Zack Ryder came to Hawkins' aid, foreshadowing a reunion. Hawkins competed in the Royal Rumble match entering at number 9, eliminating Titus O'Neil before being eliminated by Samoa Joe. The following night on Raw, Hawkins and Ryder teamed up, where they were defeated by The Revival. On April 5, WWE announced that Hawkins and Ryder would face The Revival at WrestleMania 35 for the Raw Tag Team Championship. At WrestleMania, after having amassed a losing streak of 269 matches, Hawkins pinned Scott Dawson to win the Raw Tag Team Championship and ended his losing streak. The next night on Raw, Hawkins and Ryder made their first successful title defense, defeating The Revival in a rematch. Hawkins' first venture into YouTube came in the form of a short lived YouTube series called Callin' Spots with Curt Hawkins, which lasted only two episodes. His first video has since been deleted but has kept up his second video where he thanks Edge for giving him his first opportunity in WWE which was being part of La Familia and for being a friend and mentor. Hawkins also appeared in Zack Ryder's YouTube series, Z! True Long Island Story. After sporadically appearing on the show he became a regular on the show. Hawkins and Reks have appeared on the show together also. One of Hawkins most memorable segments came after Zack Ryder started to use a cane on his show. Scott Stanford, another regular on the show, has come up to Hawkins and Reks saying that they are using the Broski Cane, this has annoyed the pair on every occasion stating that Hawkins used a cane first. Hawkins and Reks created an animated YouTube series called MidCard Mafia in 2011, but the show upset WWE management, so Hawkins and Reks cancelled the series and removed the uploaded shows. Hawkins also appeared in multiple episodes of WWE Inbox, a show where Superstars and Divas answer questions submitted by fans on Twitter. On episode five of Santino Marella's "Foreign Exchange," Marella and Yoshi Tatsu gave him their spare change after seeing him wearing his "Change for NXT" shirt. Hawkins was also a supporting actor in the film (Romance) In the Digital Age. In 2018, Hawkins started a podcast with Zack Ryder about wrestling figures called The Major Wrestling Figures Podcast. Curt Hawkins made his video game debut in WWE SmackDown vs. Raw 2009. He later returned to the series in WWE 2K18. He also appears in WWE 2K19 and the mobile game WWE SuperCard. While he was inactive in WWE, in 2014, Myers and Pat Buck opened a wrestling school in Hicksville, New York called Create A Pro Wrestling Academy. Myers married his long time girlfriend, Lizzie Karcher on October 9, 2015. The couple have a daughter together, born on June 14, 2017 named McKenzie. He is also good friends with Zack Ryder and Trent Barreta in real life as they trained together during the early years of their careers. ^ a b c d e f g h i "Curt Hawkins". Online World of Wrestling. Retrieved October 8, 2016. ^ a b c d "Curt Hawkins". World Wrestling Entertainment. Retrieved May 20, 2010. ^ a b c "NYWC Results". Online World of Wrestling. Retrieved December 12, 2009. ^ a b c d "NYWC Tag Team Title history". New York Wrestling Connection. Archived from the original on July 14, 2011. Retrieved March 4, 2012. ^ Gerweck, Steve (June 15, 2007). "OVW Six Flags Super Summer Sizzler Series No. 3 Results". Archived from the original on June 21, 2007. Retrieved June 16, 2007. ^ Robinson, Bryan (May 1, 2007). "Fighting for ECW's Heart and Soul". WWE. Archived from the original on May 4, 2007. Retrieved January 13, 2019. ^ Robinson, Bryan (June 5, 2007). "Chairman falling deeper and deeper into the abyss". World Wrestling Entertainment. Retrieved November 11, 2007. ^ Robinson, Bryan (May 8, 2007). "Spirit of ECW Splashed". World Wrestling Entertainment. Retrieved November 11, 2007. ^ Robinson, Bryan (May 22, 2007). "Experiencing painful revenge". World Wrestling Entertainment. Retrieved November 11, 2007. ^ "SmackDown drafts up". World Wrestling Entertainment. Retrieved November 11, 2007. ^ Parks, Greg. "7/6 WWE Smackdown: Parks's Ongoing Coverage of the Show". Pro Wrestling Torch. Archived from the original on August 10, 2017. Retrieved January 13, 2019. ^ "Finding the way". World Wrestling Entertainment. Archived from the original on November 11, 2007. Retrieved November 11, 2007. ^ Dee, Louie (August 12, 2009). "Three for All". World Wrestling Entertainment. Retrieved December 21, 2007. ^ McNamara, Andy (January 4, 2008). "Smackdown: Mysterio beats the clock". SLAM! Sports. Canadian Online Explorer. Retrieved January 13, 2019. ^ Passero, Mitch (July 20, 2008). "Out of the shadows, into the golden light". World Wrestling Entertaiprompting nment. Archived from the original on July 23, 2008. Retrieved July 21, 2008. ^ "Hawkins and Ryder: WWE's youngest Tag Team Champions". World Wrestling Entertainment. August 7, 2008. Retrieved August 8, 2008. ^ "8/8 WWE SMACKDOWN: Parks's Ongoing "Real-Time" Coverage of the CW Show". Pro Wrestling Torch. Retrieved September 27, 2013. ^ DiFino, Lennie (August 17, 2008). "Unleashed in Hell". World Wrestling Entertainment. Retrieved September 21, 2009. ^ Waldman, Jon (September 13, 2008). "Smackdown: Kozlov seeks competition". Slam! Sports. Canadian Online Explorer. Retrieved September 22, 2009. ^ Martin, Adam (September 22, 2008). "Friday Night Smackdown Tapings – Columbus (Last show on CW)". WrestleView. Retrieved September 22, 2008. ^ Martin, Adam (August 13, 2009). "Wrestling News and Results, WWE News, TNA News, ROH News - Wrestleview.com". wrestleview.com. Retrieved June 13, 2015. ^ Csonka, Larry (August 7, 2009). "FCW Results 8.06.09: Tampa, FL". 411mania.com. Retrieved September 5, 2009. ^ "Florida Championship Wrestling Tv Spoiler Results From Tampa, Florida: Tommy Dreamer Vs. Eric Escobar And More". PWInsider. Retrieved October 19, 2011. ^ "FLORIDA CHAMPIONSHIP WRESTLING IN PUNTA GORDA, FL RESULTS - PWInsider.com". pwinsider.com. Retrieved June 13, 2015. ^ a b Ashis (November 20, 2009). "FCW TV Taping Results [Spoilers]". 411mania.com. Retrieved November 27, 2009. ^ "Florida Championship Wrestling Tv Taping Results: Irwin R. Shyster Appears, Kaval (Low Ki) Back In Action And More". PWInsider. Retrieved October 19, 2011. ^ Gerweck, Steve (January 15, 2010). "FCW crowns new tag champions". WrestleView. Retrieved January 16, 2010. ^ Dykens, Brad (May 5, 2010). "WWE SmackDown! 2010 05 07". Black Pants, Inc. Online World of Wrestling. Retrieved May 7, 2010. ^ Murphy, Ryan (May 13, 2010). "How to make an impact". World Wrestling Entertainment. Archived from the original on March 3, 2016. Retrieved May 13, 2010. ^ Burdick, Michael (May 21, 2010). "Stepping Over the Limit". World Wrestling Entertainment. Retrieved May 29, 2010. ^ a b Hillhouse, Dave (June 5, 2010). "Smackdown: ...And The Dead Man Leaveth!". Slam! Sports. Canadian Online Explorer. Retrieved July 23, 2010. ^ Hillhouse, Dave (June 12, 2010). "Smackdown: Do you feel lucky, Punk?". Slam! Sports. Canadian Online Explorer. Retrieved July 23, 2010. ^ Hillhouse, Dave (June 19, 2010). "Smackdown: Kane's Law and Disorder". Slam! Sports. Canadian Online Explorer. Retrieved July 23, 2010. ^ Murphy, Ryan (October 7, 2010). "With friends like these". World Wrestling Entertainment. Retrieved October 7, 2010. ^ Grainger, Taylor (October 14, 2010). "It's a scream". World Wrestling Entertainment. Retrieved October 14, 2010. ^ Murphy, Ryan (November 18, 2010). "Girl power". World Wrestling Entertainment. Retrieved November 18, 2010. ^ "Rewritinghistory". World Wrestling Entertainment. November 25, 2010. Retrieved November 25, 2010. ^ Caldwell, James. "CALDWELL'S WWE SUPERSTARS RESULTS 12/9: Complete coverage of Hawkins vs. Barreta III, Divas spotlight, WWE promotes "controversial" Top 50 DVD". Pro Wrestling Torch. Retrieved September 22, 2011. ^ "WWE News: Full list of 2011 WWE Draft Picks (televised Raw Draft & Supplemental Draft)". Pro Wrestling Torch. April 26, 2011. Retrieved April 27, 2011. ^ Caldwell, James. "CALDWELL'S WWE SUPERSTARS REPORT 5/26: Armando Estrada returns, Santino vs. Ryder comedy, Top-Rope Elbow Week (w/VIDEO)". Pro Wrestling Torch. Retrieved September 22, 2011. ^ Caldwell, James. "CALDWELL'S WWE SUPERSTARS REPORT 9/8: Bryan dominates main event, Fox vs. Tamina, returns & TV debuts & squash matches". Pro Wrestling Torch. Retrieved September 22, 2011. ^ Bishop, Matt. "WWE NXT: Show becomes tag team anarchy". SLAM! Sports. Canadian Online Explorer. Retrieved November 4, 2011. ^ Bishop, Matt. "WWE NXT: Show becoming land of misfit toys". SLAM! Wrestling. Retrieved November 4, 2011. ^ Trionfo, Richard. "WWE.COM NXT REDEMPTION REPORT: POTENTIAL TAG TITLE CONTENDERS IN ACTION; DIVAS IN ACTION; AND A ROOKIE GETS TO WRESTLE". PWInsider. Retrieved November 4, 2011. ^ James, Justin. "JAMES'S WWE NXT REPORT 10/19: Review of NXT Week 33, talk of Rookie Challenges returns, overall show Reax". Pro Wrestling Torch. Retrieved January 6, 2012. ^ James, Justin (November 11, 2011). "JAMES'S WWE SUPERSTARS REPORT 11/10: Bryan vs. Regal wrestling showcase, Riley, Gabriel, Rock hype". Pro Wrestling Torch. Retrieved January 6, 2012. ^ Caldwell, James. "CALDWELL'S WWE RAW RESULTS 1/9: Complete "virtual-time" coverage of live Raw – Jericho Week 2, Kane-Cena/Ryder dominates, Hall of Fame". Pro Wrestling Torch. Retrieved January 10, 2012. ^ James, Justin. "JAMES'S WWE NXT REPORT 12/15 – Week 41: Showtime vs. Curtis, Love Triangle continues, Titus snaps, Ronald Reagan". Pro Wrestling Torch. Retrieved January 6, 2012. ^ Martin, Adam. "NXT Results – 1/4/12". WrestleView. Archived from the original on January 8, 2012. Retrieved January 6, 2012. ^ Walek, Gregory. "NXT Results – 1/18/12". WrestleView. Retrieved April 8, 2012. ^ Walek, Gregory. "NXT Results – 2/8/12". WrestleView. Retrieved March 27, 2012. ^ Walek, Gregory. "NXT Results – 2/29/12". WrestleView. Archived from the original on March 3, 2012. Retrieved March 27, 2012. ^ Walek, Gregory. "NXT Results – 3/7/12". WrestleView. Retrieved April 8, 2012. ^ James, Justin. "JAMES'S WWE NXT REPORT 3/21 – Week 55: Kidd vs. McGillicutty main event, bizarre episode with kidnapping & Regal foot massage, Overall Reax". Pro Wrestling Torch. Retrieved March 24, 2012. ^ James, Justin. "JAMES'S WWE NXT REPORT 4/4 – Week 57: Bateman-McGillicutty main event, physical Divas match, NXT love stories continue, Regal applies the law". Pro Wrestling Torch. Retrieved April 4, 2012. ^ James, Justin. "JAMES'S WWE NXT REPORT 4/11 – Week 58: Kidd-McGillicutty best-of-three conclusion, kidnapping caper, Regal Logic". Pro Wrestling Torch. Retrieved April 13, 2012. ^ James, Justin. "JAMES'S WWE NXT REPORT 4/18 – Week 59: Two "firings" in London; CHIVERTON'S NXT Weekly Rankings & Evaluation 4/11 – Week 58". Pro Wrestling Torch. Retrieved April 13, 2012. ^ James, Justin. "JAMES'S WWE NXT REPORT 5/9 – Week 62: JTG debuts new look, Laurinaitis infiltrates NXT, Overall Reax". Pro Wrestling Torch. Retrieved May 12, 2012. ^ Tylwalk, Nick. "Raw: Big Show sells out and the locker room empties". Slam! Sports. Canadian Online Explorer. Retrieved May 21, 2012. ^ Caldwell, James. "CALDWELL'S WWE NO WAY OUT PPV REPORT 6/17: Ongoing "virtual time" coverage of live PPV – Cena vs. Show, potential "firings," who will A.J. choose?". Pro Wrestling Torch. Retrieved June 23, 2012. ^ Caldwell, James. "CALDWELL'S WWE MITB PPV REPORT 7/15: Complete "virtual time" coverage of live PPV – Punk vs. Bryan, Sheamus vs. Del Rio, two MITB matches". Pro Wrestling Torch. Retrieved August 4, 2012. ^ Caldwell, James. "CALDWELL'S WWE RAW RESULTS 7/23: Complete "virtual-time" coverage of live Raw #999 – WWE recognizes 1,000 episodes, WWE Title match, Lesnar, Rock, DX, wedding". Pro Wrestling Torch. Retrieved July 28, 2012. ^ Parks, Greg. "PARKS' WWE SMACKDOWN REPORT 8/10: Complete "virtual time" coverage of the Friday night show, including Dolph Ziggler as guest on Jericho's Highlight Reel". Pro Wrestling Torch. Retrieved August 31, 2012. ^ Parks, Greg. "PARKS' WWE SMACKDOWN REPORT 8/17: Ongoing "virtual time" coverage of Friday night show, including follow-up to Del Rio removed from World Title match at Summerslam". Pro Wrestling Torch. Retrieved August 19, 2012. ^ Caldwell, James. "WWE makes Reks's departure official". Pro Wrestling Torch. Retrieved August 31, 2012. ^ Caldwell, James. "WWE News: Tyler Reks details his decision to leave WWE – was there a breaking point?, will he ever wrestle again? (w/AUDIO)". Pro Wrestling Torch. Retrieved August 31, 2012. ^ "WWE NEWS: New Ryder YouTube episode with "apology" to WWE, Hawkins reveals injury & recent surgery, newspaper covers Punk comedy event". Pro Wrestling Torch. Retrieved October 7, 2012. ^ Caldwell, James. "CALDWELL'S WWE RAW RESULTS 1/21: Complete "virtual-time" coverage of live Raw – Rock attacked on final Raw before Rumble, plus Beat the Clock, Cena closes Raw, more". Pro Wrestling Torch. Retrieved January 22, 2013. ^ Trionfo, Richard. "WWE SATURDAY MORNING SLAM REPORT: BRODUS AND KOFI FACE THE PRIME TIME PLAYERS; JUSTIN GABRIEL VERSUS CURT HAWKINS; CODY RHODES, SHEAMUS, AND NATALYA DISCUSS FACIAL HAIR". PWInsider. Retrieved February 11, 2013. ^ "Curt Hawkins in 2013". CageMatch. Retrieved September 27, 2013. ^ "Brodus Clay, Evan Bourne, Teddy Long, Curt Hawkins and other WWE Superstars released". WWE. Retrieved June 13, 2015. ^ Kreikenbohm, Philip (June 2014). "JCW « Events Database « CAGEMATCH – The Internet Wrestling Database". cagematch.net. ^ "Show results – 8/29 PWG Battle of Los Angeles Night 1: A.J. Styles vs. former WWE star, Elgin, Daniels & Kaz, more". Pro Wrestling Torch. August 30, 2014. Retrieved August 30, 2014. ^ "GFW First "Amped" TV Taping Results (7/24): Nex*Gen Tournament, Current and Former TNA Stars, Karen and Jeff Jarrett, and More". ^ "*SPOILERS* TNA Impact Wrestling Tapings from 7/27/15". lordsofpain.net. ^ a b Johnson, Mike (July 28, 2015). "Another big TNA spoiler". Pro Wrestling Insider. Retrieved July 29, 2015. ^ a b "10/09 Powell's WWE No Mercy Kickoff Show coverage: American Alpha and The Hype Bros vs. The Ascension and The Vaudevillains". Pro Wrestling Dot Net. Retrieved October 15, 2016. ^ "What Happened to Curt Hawkins Last Night". Pro Wrestling Insider. Retrieved October 15, 2016. ^ a b "10/18 WWE Smackdown LIVE – Parks's Ongoing, Real-Time Report". Pro Wrestling Torch. Retrieved October 22, 2016. ^ a b "Powell's WWE Smackdown Live Hit List: James Ellsworth challenges AJ Styles for the WWE Championship, Carmella brings up Nikki Bella's relationship with John Cena, Kane reappears in a coffin, Baron Corbin destroys Jack Swagger". Pro Wrestling Dot Net. Retrieved October 22, 2016. ^ "McNEILL's Live Blog of WWE No Mercy 2016". Pro Wrestling Torch. Retrieved October 22, 2016. ^ "11/1 WWE Smackdown LIVE – Parks's Complete, Real-Time Report". Pro Wrestling Torch. Retrieved November 2, 2016. ^ "11/8 WWE Smackdown LIVE – Parks's Complete, Real-Time Report". Pro Wrestling Torch. Retrieved November 13, 2016. ^ Wortman, James (August 2, 2017). "Curt Hawkins puts a unique spin on his 100-match losing streak". WWE. Retrieved February 12, 2018. ^ Benigno, Anthony. "Heath Slater def. Curt Hawkins". WWE. Retrieved July 10, 2017. ^ Mrosko, Gene (December 31, 2017). "Curt Hawkins didn't win a single match in 2017, losing streak stands at 0-152". Cageside Seats. Retrieved February 12, 2018. ^ Cox, James. "WWE Main Event: Curt Hawkins Goes 0-188". Wrestling Observer Newsletter. Retrieved April 4, 2018. ^ Heydron, Zack (June 4, 2018). "HEYDORN'S WWE RAW REPORT 6/4: Alt Perspective coverage of the live show including Finn Balor vs. Kevin Owens, Braun Strowman vs. Bobby Roode, and more". Pro Wrestling Torch. Retrieved July 15, 2018. ^ "Curt Hawkins to replace Braun Strowman as Ember Moon's partner for the WWE MMC Playoffs". WWE. Retrieved November 26, 2018. ^ Burdick, Michael (November 27, 2018). "Jinder Mahal & Alicia Fox def. Curt Hawkins & Ember Moon". WWE. Retrieved December 25, 2018. ^ "1/21 WWE Raw Results: Keller's report on final Royal Rumble hype, Ronda Rousey in a tag match, a debut of an NXT wrestler, Balor as no. 1 contender". Pro Wrestling Torch. Retrieved January 22, 2019. ^ Keller, Wade (January 28, 2019). "1/28 WWE Raw Results: Keller's report on post-Royal Rumble episode including Seth Rollins Rumble victory". Pro Wrestling Torch. Retrieved February 2, 2019. ^ "Raw Tag Team Title Match Added To WWE WrestleMania 35". ^ "Curt Hawkins YouTube page". ^ "Z! True Long Island Story YouTube page". ^ Stewart, Josh (June 17, 2012). "Glen Cove native Curt Hawkins back in Long Island with WWE". Newsday. Retrieved August 31, 2012. ^ "Curt Hawkins Romance in the Digital Age". WWE. November 14, 2017. ^ "CURT HAWKINS TALKS WWE RELEASE, NXT, HIS NEW WRESTLING SCHOOL AND MORE - PWInsider.com". pwinsider.com. Retrieved June 13, 2015. ^ "Create A Pro Wrestling Academy". createaprowrestling.com/. Retrieved September 22, 2015. ^ Middleton, Marc. "More On Hornswoggle Falling At Wedding, Paige – SHIMMER, WWE Films At Dudley Boyz' School". WrestlingInc. Retrieved October 13, 2015. ^ Myers, Brian (June 15, 2017). "I'm gonna watch you shine..." Instagram. ^ "Alpha-1 Wrestling on Twitter: 'NEW ALPHA MALE CHAMPION @TheCurtHawkins BRIAN MYERS!". twitter.com. April 12, 2015. Retrieved April 12, 2015. ^ Kreikenbohm, Philip. "A1 Alpha Male Championship « Titles Database « CAGEMATCH – The Internet Wrestling Database". cagematch.net. ^ Tanabe, Hisaharu. "Deep South Wrestling Tag Team Title". Retrieved June 16, 2007. ^ "FBW Heavyweight Championship history". cagematch.net. ^ "OVW championship histories". ovwrestling.com. Archived from the original on April 5, 2011. ^ "PWS Television Championship". cagematch.net. Retrieved June 13, 2015. ^ "History of the WWE Tag Team Championship: Curt Hawkins & Zack Ryder". World Wrestling Entertainment. July 20, 2008. Archived from the original on December 17, 2008. Retrieved July 21, 2008. Wikimedia Commons has media related to Curt Hawkins. This page was last edited on 19 April 2019, at 22:59 (UTC).